LWW. PAPERBACK. 145114380X New Condition. . New. LWW. PAPERBACK. 145114380X Like New Condition. . Fine. LWW. PAPERBACK. 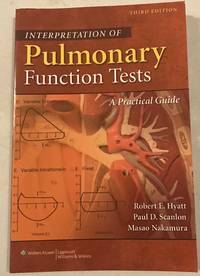 145114380X BRAND-NEW Interpretation of Pulmonary Function Tests. FAST FedEx shipping (you'll receive your order within 1-5 business days after shipping in most cases*), this helps to ensure your order arrives in perfect condition. PLEASE NOTE: FedEx does not generally deliver to PO Boxes or APO addresses, so please be sure to give us a physical street address to deliver to; also, unfortunately, we cannot ship this item to Alaska or Hawaii. THANKS! *(this applies to domestic shipments within the continental US - other destinations may take longer) (L1218148999D6T) . New. LWW. PAPERBACK. 145114380X *DELIVERED 1-4 business days after shipping** BRAND-NEW. **DELIVERED FAST! Delivery EAST of the Mississippi River only takes 1-2 BUSINESS DAYS after shipping (EXCEPTION: delivery to FL, ME, VT, NH, and a small area of MA takes 3 BUSINESS DAYS after shipping); orders WEST of the Mississippi are usually delivered within 1-4 BUSINESS DAYS after shipping (small areas of OR and ID can take 5 business days). PLEASE NOTE: UPS does not generally deliver to PO Boxes or APO addresses, so please be sure to give us a physical street address to deliver to; also, unfortunately, we cannot ship this item to Alaska or Hawaii. *(this applies to domestic shipments within the continental U.S. - other destinations may take longer). Book has slight "scuff" on back (hardly noticeable - less than 1 cm). Looks completely BRAND-NEW. Inside is in perfect, unused condition. THANKS! . Fine. LWW. PAPERBACK. 0781778824 New Condition. . New. LWW. PAPERBACK. 0781778824 Like New Condition. . Fine. LWW. PAPERBACK. 145114380X Item in good condition. Textbooks may not include supplemental items i.e. CDs, access codes etc... . Good. 2014. LWW. PAPERBACK. 0781778824 Like new! In Beautiful spotless condition,clean pages,tight binding,text unmarked, very gentle use . Fine.